What's a good definition of LitRPG? Discussion in 'All Things LitRPG' started by Conor Kostick, May 17, 2017. 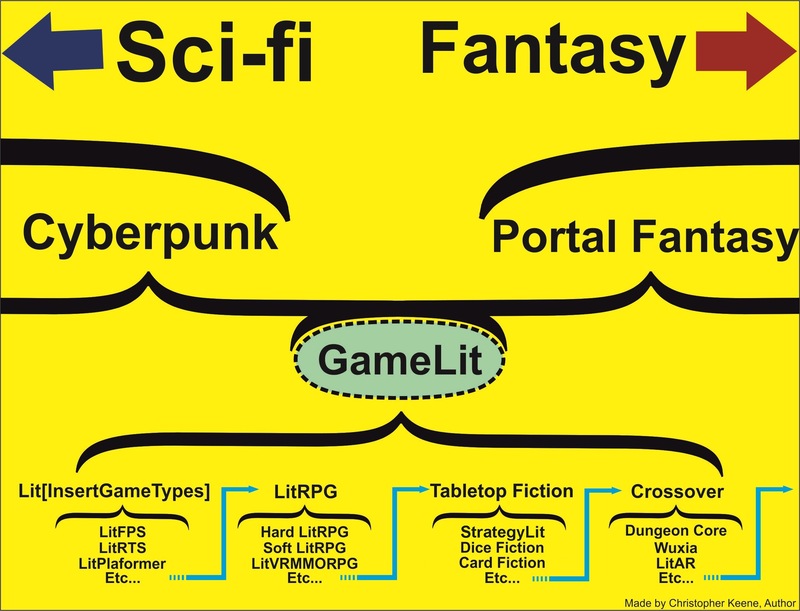 So if I want to create electronic literature out of litRPG, can just I call it "elitRPG"? VacillateWildly and Paul Bellow like this. I'm new to these whole internet things but if we could term it like that it would be cool. E-lit stands for electronic literature which can be used to make a new branch of litRPG, and I'm thinking to write a short story with simple turn-based RPG integrated as a start. I'm only on page 7 so excuse me for bringing this up again...still? But this is how I think of LitRPG as a reader. There are fantasy LitRPG, and scifi LitRPG. Being someone who craves magic I suppose it makes sense that I read almost exclusively the former. The connection, the LitRPG aspect, is that there are clear gaming mechanics involved. Even if the world isn't a gaming or virtual world, there is a structure that exists in all RPGs. We, the reader, will see clear character progression (call it levels if you must), a way to quantify skills and abilities, and inclusive world building that fits clear 'rules'. The biggest thing to remember here is this: RPG. If your story can't translate into a game (regardless of the fantasy or scifi) then it's likely not going to fit into LitRPG. Someone mentioned 'sufficient magic' earlier. I found it on amazon through a LitRPG search. However thinking back on it, I don't recall it having any 'stats' windows, or skill level ups. I suppose the argument is that it does not qualify as a LitRPG piece of literature. I would say however that it could be easily turned into an RPG. There are always going to be outliers in any field of writing just like there are examples that exemplify the genre. Game-like progression in a gameified world. That's pretty much it. If the stats matter, you have LitRPG. LWFlouisa, Berserk and RauthrMystic like this. I have the partcular challenge, is while mine technically fits under MMORPG like, it's closer to JRPG than say Skyrim. So it would naturally have different elements. Plus the "Game Universe", that's only marketed as being a game, but is really an alternate universe which the dystopian government wants to control. Thus it would almost defeat the purpose of having things like stats, as it reduces the emmersive experience. Voreth's Promise is only made to look like a game, as a form of abtract mind control, and is closer to an artificial universe, with its own history and customs that was originally matching our own, but evolved significantly in a different direction. So I'm not sure what else you'd call it. It's why some of us came together and made GameLit. Although, I'm sure people may debate for and against your book being LitRPG, I doubt there would be any problem claiming GameLit. Find me on Twitter @DustinTigner. Paul Bellow and LWFlouisa like this. I might try that, although it's prequel is even stranger. In the main book though, not only are they in a game, when they log out they still have "residuals" where MCs from the pseudo-game make for themselves Meatspace avatars and life in our world. Yuli Ban, Dustin Tigner and Paul Bellow like this. I have the partcular challenge, is while mine technically fits under MMORPG like, it's closer to JRPG than say Skyrim. Glad we solved that one! I think one aspect of contention for me: I've beginning to wonder if mine is a different subset of GameLit than LitRPG. It's closer to Point And Click/Visual Novel/Roguelike, with extremely minimal combat elements if any. It focuses more on outsmarting, not combatting the enemy directly. And realistic stats. I can't say no stats, but I would say not the crazy amount of HP that comes with most JRPGs. Nore the melodrama. Princesses rescue themelves, once your dead you're dead. If a Katana or Guillotine goes through your neck, you're probably not coming back from a K.O. But other characters will remember you. The exception is reincarnation, which is an established fact in my universe. My escape hatch from keeping it be to dark. The focus is more on the overall life of the gamer, including the game itself. More controversially maybe, you die in the game you die in real life. Using this, it could be reasonably argued I only ever wrote a LitRPG once, but pretty much always wrote a kind of GameLit.